October - April: 9am, 10am, 11am, 12pm(noon), 1pm, 2pm, 3pm, 4pm and 5pm. Discover Dubai from a different view as you cruise past Dubai's skyline leaving the hustle and bustle behind. Enjoy a relaxed cruise and a panoramic tour of the Dubai Marina, Palm Jumeirah and Burj Al Arab. The Dubai skyline and the cityscape look brilliant from the waters! You will be accompanied by an English speaking guide during your 99-minute cruise, who will point out the major landmarks that you will come across during the cruise. See it all with our original and most popular 99 minutes Guided Sightseeing Tour. Sights include Palm Jumeirah, Atlantis the Palm, Burj Al Arab, JBR, Dubai Marina and son on.Atlantis the Palm, Burj Al Arab, JBR, Dubai Marina and new attractions such as Bluewaters Island and Ain Dubai. Also, multiple boats will now depart on the hour every hour, from 9am to 5pm. There is plenty to see on this short trip. So, get your cameras ready! 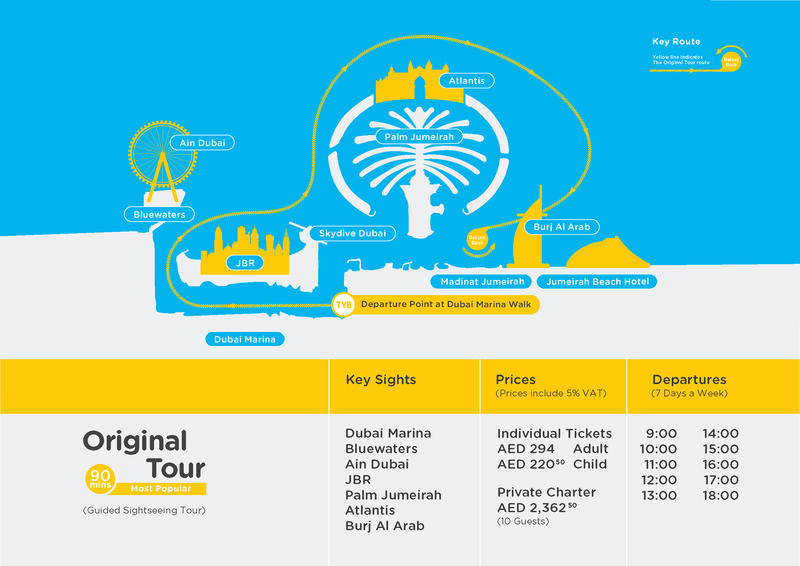 You will board your yellow boat from Dubai Marina Walk, opposite the Spinney’s building. The tour is perfect for those who are short on time and want an enjoyable experience. The yellow boat will speed through the azure waters of the Arabian Sea facing the sky-high buildings of the most spectacular marina in the world. During the course of the cruise, the English speaking guide onboard will tell you about the sights that you will come across. Next, you will cruise around the amazing Palm Jumeirah, home to the Atlantis Hotel. Here your boat will slow down for a perfect photo opportunity. After Palm Jumeirah, you will head towards the world famous 7-star Burj Al Arab hotel. After marveling the unique architecture of the building, the boat will head back to the starting point, passing through the Royal Palaces and Palm Lagoon. After sailing for 99 minutes, your sightseeing cruise will end at the point it started. Great. Thanks to Joy and skipper.